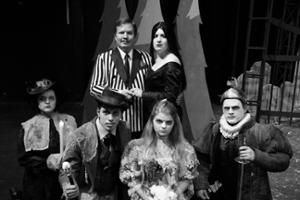 A new twist on an old favorite creepy American comic strip family, turned television, film and culture stars, The Addams Family, can be seen in The Addams Family, a New Musical, which opens Friday, July 14 at Southern Illinois University Edwardsville’s Dunham Hall Theater. The Addams Family, a New Musical will be performed at 7:30 p.m. Friday-Saturday, July 14-15 and July 21-22 and at 2 p.m. Sunday, July 16 and July 23. “Charles Addams, the creator of the Addams Family comic strip, knew that people would find humor in his charming, if not macabre, characters,” said Wendy Greenwood, director and SIUE Department of Theater and Dance alum. “We can easily identify with their duality; their lighter and darker sides. The Addams Family has taken on many incarnations since they were first published as a comic strip in 1938. Later, the life and times of this weirdly delightful family was set to music when it was launched on Broadway in 2010. The musical is based on the book written by Marshall Brickman and Rick Elice, and the music and lyrics were done by Tony Award-nominated Andrew Lippa. The Addams Family, a New Musical features an original story, and it’s every father’s nightmare. Wednesday Addams, the ultimate princess of darkness, has grown up and fallen in love with a sweet, smart young man from a respectable family – a man her parents have never met. And if that weren’t upsetting enough, Wednesday confides in her father and begs him not to tell her mother. Now, Gomez Addams must do something he’s never done before – keep a secret from his beloved wife, Morticia. Everything will change for the whole family on the fateful night they host a dinner for Wednesday’s ‘normal’ boyfriend and his parents. General admission is $15 for adults and $12 for seniors, non-SIUE students, SIUE retirees, alumni, faculty and staff. SIUE students with valid identification get in free. Groups of 10 or more receive 15-20 percent off the single ticket purchase price. To purchase tickets or for more information, call the Summer Showbiz Box Office at 618-650-2774. Visits may be made to the Summer Showbiz Box Office during the daytime, Monday-Friday, in Katherine Dunham Hall, room 1042B. You can also send a message to theater-tickets@siue.edu. SIUE’s Summer Showbiz presents three productions during its June through July season. All productions are open to the community at large. The Department of Theater and Dance is part of the College of Arts and Sciences. Pictured left to right on front row: Riley Kloostra, Luis Aquila, Lydia Petersen and Jacob Callahan; and on back row: Christopher Kernan and Leah Milton.